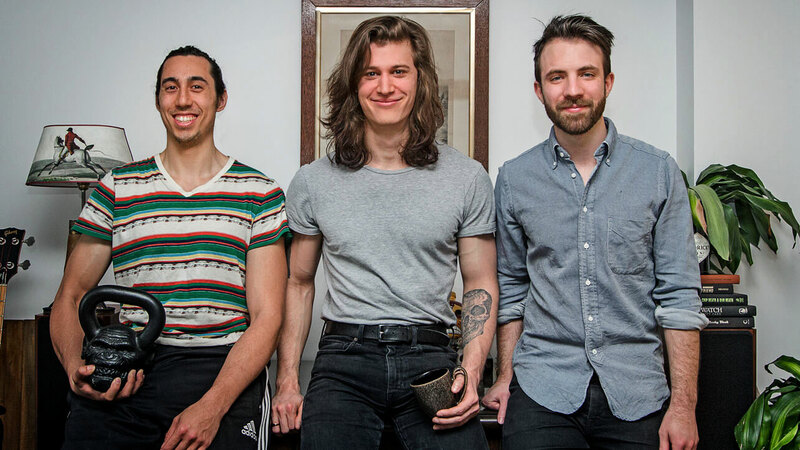 There are three of us who founded Bony to Beastly: Marco (left), Shane (centre) and Jared (right). All three of us have been skinny—really skinny. We tried to build muscle… and we failed over and over again. But we learned how to beat it, and it transformed our lives. We felt healthier, we had more energy, we looked way better, we were four times as strong—four times as strong. We couldn't even believe it. We had gone from feeling trapped in our bodies to feeling like we were thriving in our bodies. And we loved it so much that we decided to dedicate our lives to helping other skinny guys conquer their genetics. Our body type is rare, and there's so much bad information out there, but once you figure out how to eat and train for your body type, you're going to realize how amazing it is. I know that might sound crazy, but a couple months from now, you'll agree. Oh, and I should also mention that we're properly qualified. When we decided to make this our lives, we got serious about it. Marco got a university degree in Health Sciences, he's interned under the best Strength & Conditioning coaches in the world, he's got a dozen different certifications, and before starting Bony to Beastly with us, he was making his living helping professional football players and Olympic rugby players bulk up. 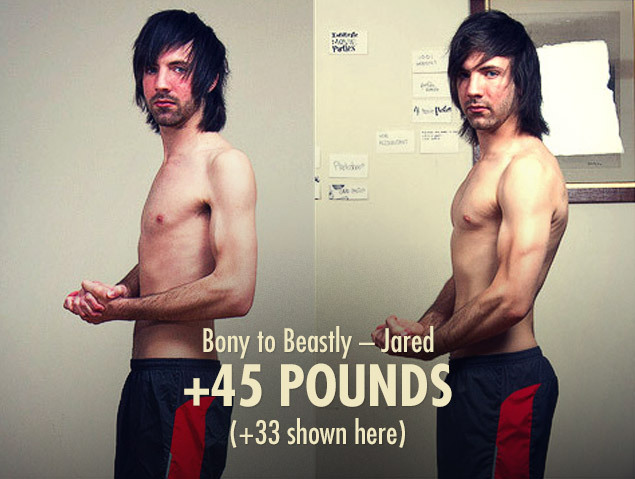 I’m your stereotypical ectomorph hardgainer. At 6’2, I have the wrist size of the average 5’4 man. My limbs are all long and lanky, my tendons are long, and my muscle bellies are short. I’ve got the metabolism of a lion but the appetite of a small mouse. At first I thought that was a horrible thing, but honestly, it was a blessing in disguise. It started off hard, though. No matter what I tried, I couldn’t get past 130 pounds. That's a BMI of 16.7. That's "dangerously underweight," which my doctor would always remind me. It was thin enough for me to look "sick," which had my parents constantly worried. And it made me look weak enough that girls would joke that they'd protect me. That wasn’t the kind of man I wanted to be. So I decided to out-nerd my genetics. Every night I would come home after work and read textbooks, look up studies on pub med, and read through muscle-building research reviews. 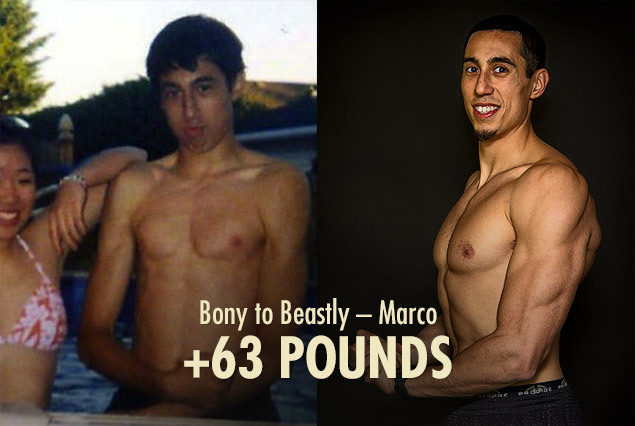 I was able to gain 25 pounds on my own, and then I realized the value of seeking out the help of a professional, and Marco helped me gain my final 30 pounds. I've gained 55 pounds overall. Still at my initial 11% body fat. When I met my fiancée, she told her best friend about how she'd met this amazing guy, and he was "so big and strong!" The woman I cared most about in the world didn't just feel safe around me, she thought my strength was one of my defining attributes. I started to like my body. It worked well, I felt amazing, my focus went up, and I even felt smarter. One of my excuses had always been, if I can't be the strong guy, I'll be the smart guy. But building a healthier body was helping me with that too! 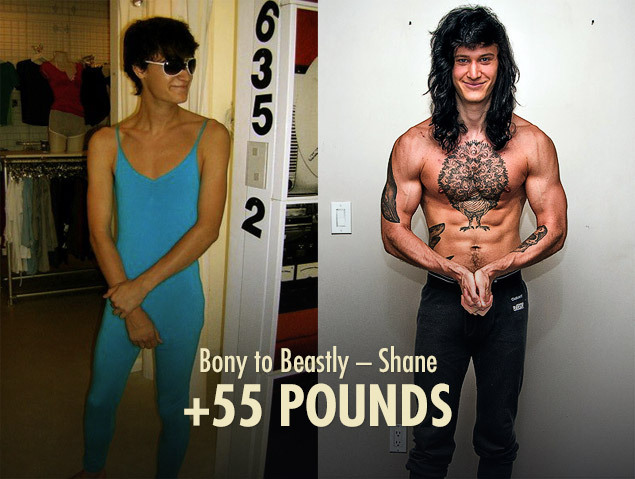 Remembering how hopeless I felt for years, and how much better I felt in every way, I realized that I wanted to spend my life helping other naturally skinny guys grow. As the pain worsened, I started with simple remedies like icing and wrist braces. They didn’t work. When the pain became unbearable, my doctor-prescribed physiotherapy, ultra-sound treatment and Naproxen (a prescription medication that gave me nosebleeds)—none of which came remotely close to solving the issue. The pain was getting to the point where I couldn’t even be on a computer. So my solution was to learn to use my left hand instead, which was working well until I developed tendonitis on my left arm as well. My physiotherapist said she had never seen tendonitis in both arms in such a young person. 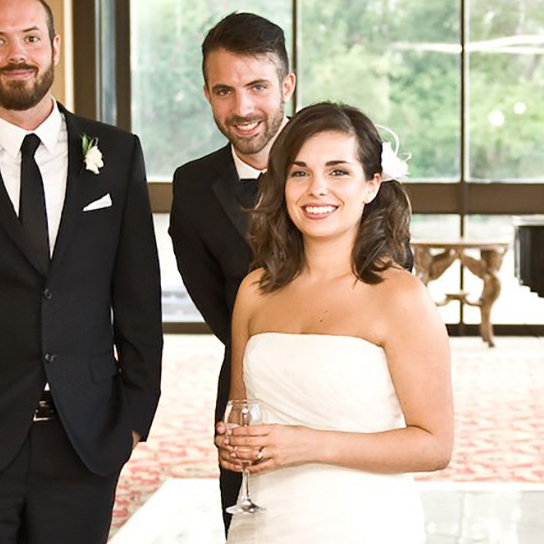 Shane and I met in university and we started a graphic design business after we graduated. After work we decided to do an “experiment” we titled Lean to Mean. The goal was to gain as much muscle as humanly possible over the course of four months. In the first month alone I managed to gain 22 pounds. All it took was those 30 days of weightlifting and nutrition to completely change my life. Over the next two months I gained another 11 pounds, bringing me up to 163 pounds (shown in the photo). It completely changed the way I looked and felt. I was hooked. Building all that muscle had helped my tendonitis, but I still struggled daily with the pain. Then the very first day I met Marco, he showed me a simple soft-tissue technique that he used to help the athletes he was training. Just a few weeks later, my tendonitis no longer affected my life. I didn’t need to stress about being able to do my job, and I was finally pain free. It was a huge moment for me. My wife trains with me now too, and we love it. Lately I’ve been happily hovering at around 175/180—over 45 pounds heavier than when I started. I no longer see getting older as a downhill progression into more and more pain, but rather as an opportunity to continue to get stronger, move better, and look better. In high school, at 6’4 and 150 pounds, I was pretty desperate. I was eager to increase my confidence (especially around girls), and building muscle seemed like the way to do it. I bought Arnold’s Encyclopedia of Bodybuilding and spent all my free time either desperately training in the gym, or desperately reading scholarly articles about muscle. However, it didn't go well. Even though I felt like I was learning a lot, and even though I was building muscle… I kept on running into problems. I developed chronic knee pain, then chronic shoulder pain, then my posture was getting worse, and then I started to feel fatigued all day long. The muscle was coming at a steep price. I felt less healthy, less athletic, less alive. So I got a Bachelor of Health Sciences degree from the University of Ottawa., then interned with strength legend Eric Cressey, studied with the Postural Restoration Institute, got a dozen certifications—strength & conditioning, personal training, diet, posture, etc. At that point, I was obsessed. I started up a Strength & Conditioning business, and was fortunate enough to start working with amateur, professional and Olympic athletes, helping them build functional muscle. I used the money I was earning to fly all over the world going to physiology, strength, athletics and hypertrophy conferences. I also gained 63 pounds at 8% body fat—far leaner than when I started. That's when I met Shane and Jared, and I got the opportunity to help found Bony to Beastly. I was thrilled. This was an opportunity to help other naturally skinny guys avoid the years of pain and frustration that I went through. 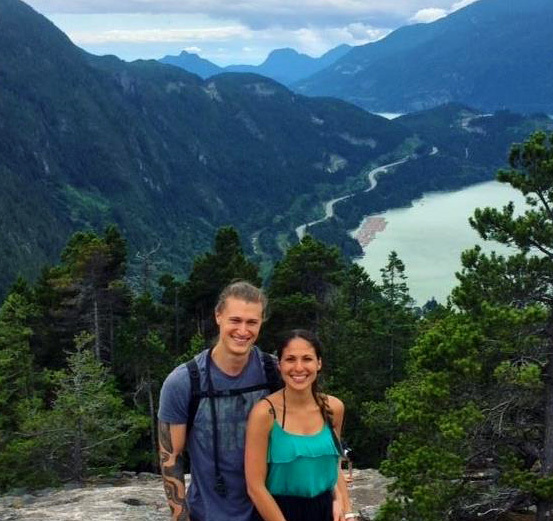 So now I worked full-time on this business, writing all the workout programs and coaching members through their issues, as well as being back full-time in university, furthering my studies. These days I play a little rugby, play a little guitar, and I'm also interested in musical theatre. I'm lucky enough to be living my dream, and I want to help you build a body that will allow you to accomplish your dreams as well.